So this new name, Barque, how do you say it? [bahrk] – sounds like a dog’s bark or bark on a tree. Now then, what does it mean? According to the dictionary, it’s a sailing vessel, which is but for our purposes, Barque is a combination of things we love – paper, dogs and cooking. It’s a pretty random combination, but it about sums up ME. Paper (think bark on trees) + Dog’s bark + the “que” nods to French influence (and cooking). So in a vague and round about way, Barque encompasses our new focus: gifts, events on paper and puppy love. Our goal is provide a unique selection of products and services, and I can pretty much guarantee that there’s not an existing store like it! I would like to be the kind of gal that waits until after Thanksgiving to decorate for Christmas… but since I’ve been in retail, decorations at home have become less about timeliness and more about a free day to actually put them out! It’s a juggle of calendars and commitments and an 8 hour window were I can squeeze it in on my one day off a week. I know that if I don’t plan ahead, it probably won’t happen. That might seem sad, but it’s workin’ for me, and I’m okay with that. So, here’s the thing. I don’t do “pretty” Christmas. I have plenty of decorations for my little home, but I’m just not an extravagant person, so you won’t find an abundance of fancy ornaments or over the top decorations. I don’t deck out every surface in garland and lights. I don’t put up 16 Christmas trees or even (gasp) put lights on the house (I’m not big on tall ladders). 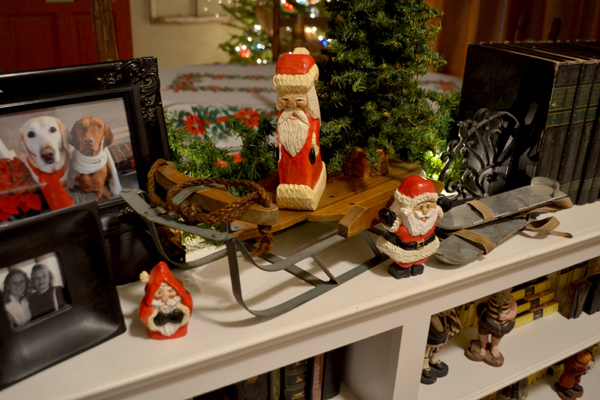 My version of “Deck the Halls” is more about the memories – an assortment of Santas given to me from my grandmother, nativities curated from estate sales or travels over the years, and other odds and ends that are sentimental, but also just blend in with my style. 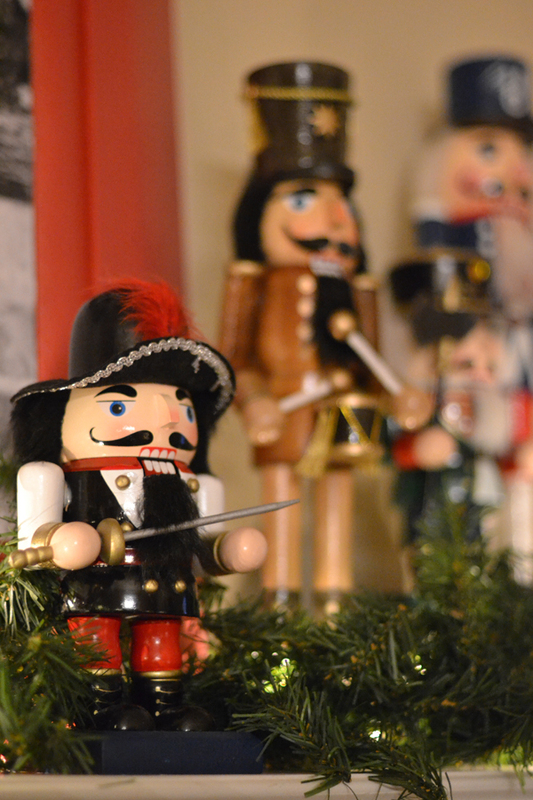 Señor Nutcracker (the official looking one with the white wooden mustache). I’m not sure why in my mind he’s a Mexican grandpa, but he is. He was my first nutcracker to “save” from an estate sale last year. 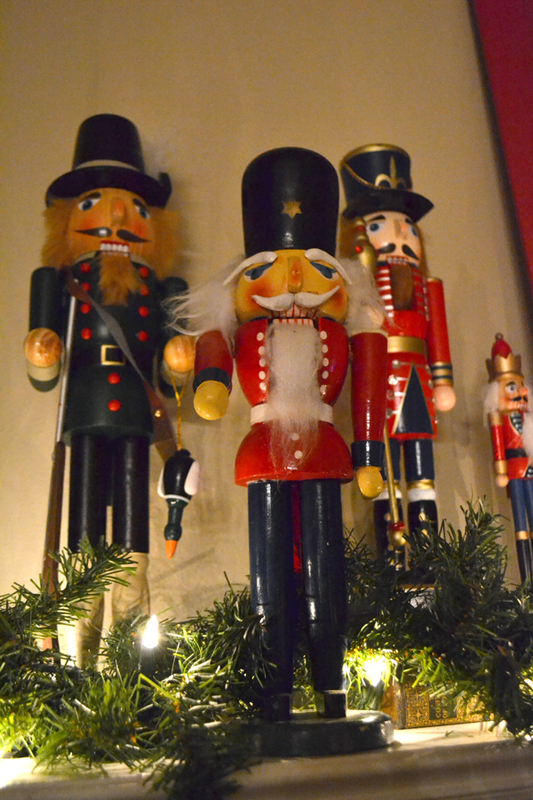 Until then, I was kind of afraid of them- I had always thought nutcrackers were sorta creepy. Since then I’ve added a few more (but don’t worry, I won’t go crazy – I still think they’re creepy en masse). 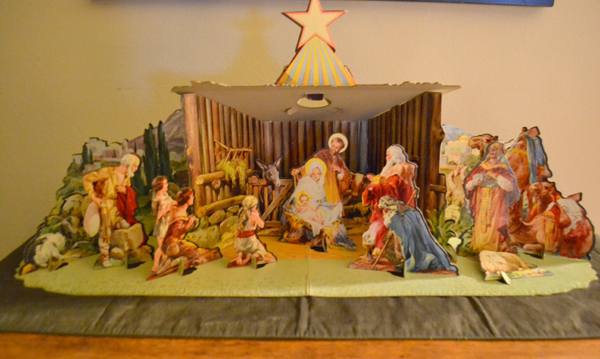 My paper nativity scene. It’s from the 1950’s and my mom has one just like it. This one I got from my friend Tony, and every year when I put it out, I send him a photo. It’s such an amazing piece of history (with its spot for the “colored wise man” and all). SO crazy to think that wasn’t offensive at the time. My tree. Now that I’m an adult, I get a real, honest-to-goodness live Noble Fir every year. I always wanted one as a kid, but my mom’s allergies were too bad – the one year we tried, that poor tree spent all of 10 minutes in the house… before it was sequestered to the back porch and eventually chopped into firewood. (sadface) Where are all the ornaments, you ask? Let’s just say having two dogs and a few unfortunate Christmases have led me to keep it simple! 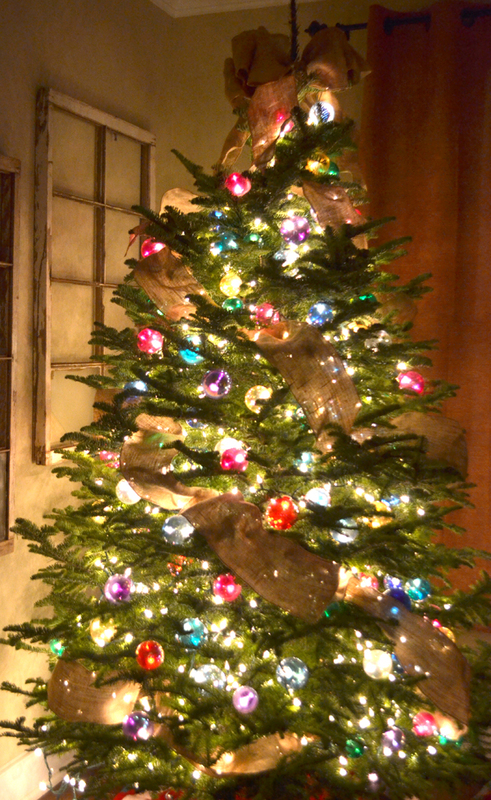 I only use plastic globes on my main tree (and this year I ventured out with a little ribbon- so far, so good). My sled. Scored at a neighborhood garage sale for $20. Love it. Ice skates. Got this pair of skates in Michigan when I went to visit my mom during one of her “nerd conferences”. 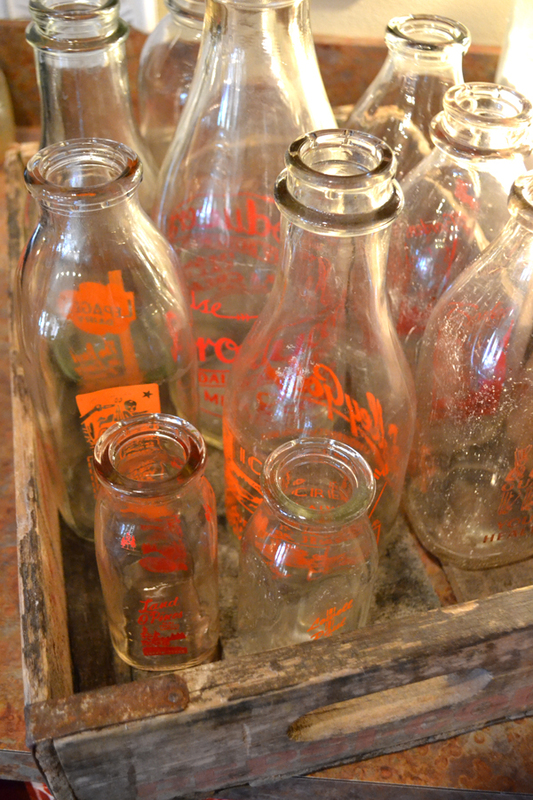 I love finding cool, local antiques when I travel! My favorite hallway. 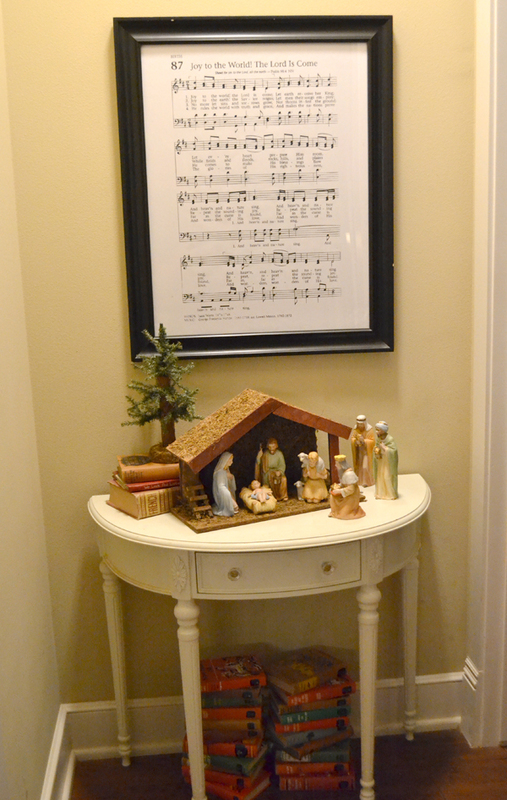 All decked out with an over-sized print of the hymn, “Joy to the World, the Lord is Come” and a nativity from my grandmother. This picture. An enlargement of my brother and I (circa 1984?) mounted on foam core. 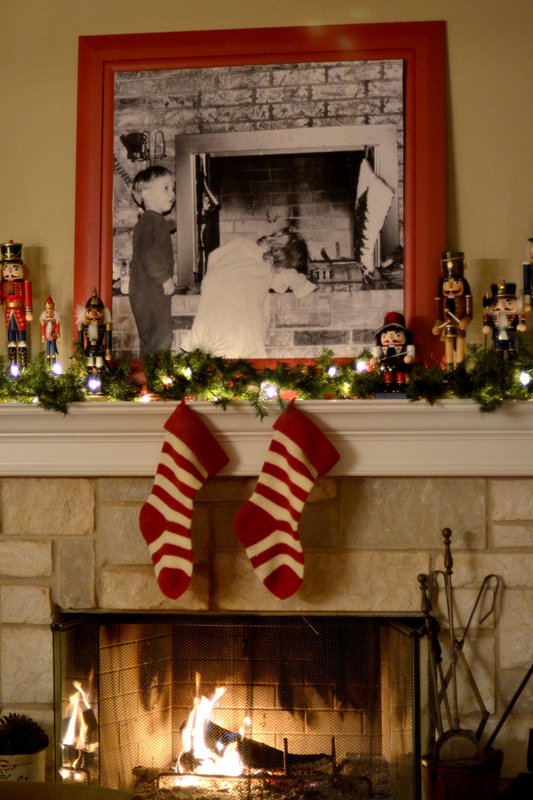 It fits snugly inside the frame I usually keep on the mantle, but I think it adds a really fun, personal holiday touch. My hand-carved Santas. These are whittled by artist Dan Rankin in Post, Texas. Since I’ve discovered them at Caprock Heirloom, I buy one every year. Just love how cute and unique they are! My “monthly” themed Santas. Always a favorite at my grandmother’s house when I was a kid, she gave them to me when I bought my first home in Dallas. 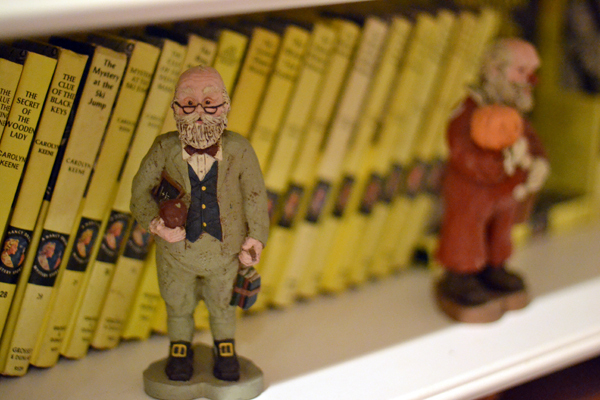 They’re so special to me, and I proudly display each Santa (depicting a different month) in my entry way. 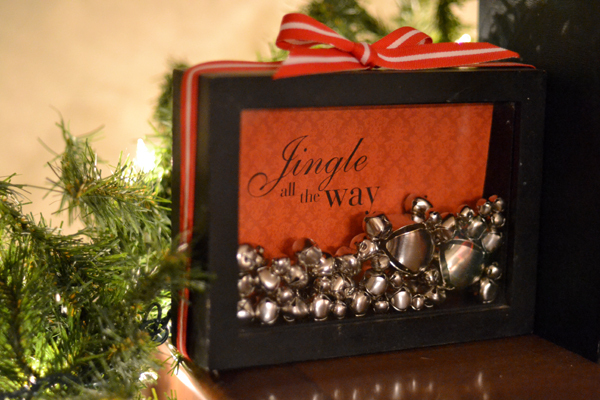 Jingle all the way. This little ditty was a pinterest project from a few years ago. It’s easy to store in a Ziploc bag and re-assemble every year in my existing shadow box frame! 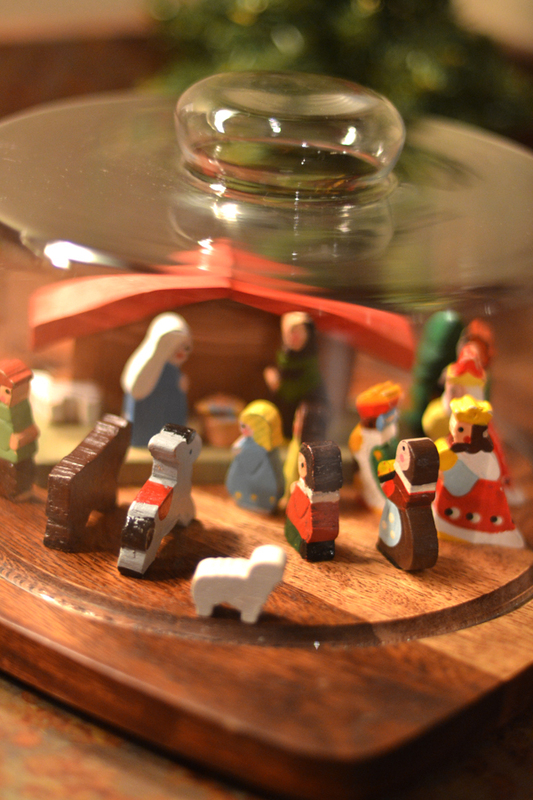 I may have saved the best for last… this is my favorite nativity set from my childhood. All of the pieces are made of wood, and I just makes my heart do a somersault when I pull it out. I keep this one inside a domed cheese board for a little extra protection. So there you have it. It’s not all of my decorations, but I think you get the idea. No PRETTY Christmas for me. 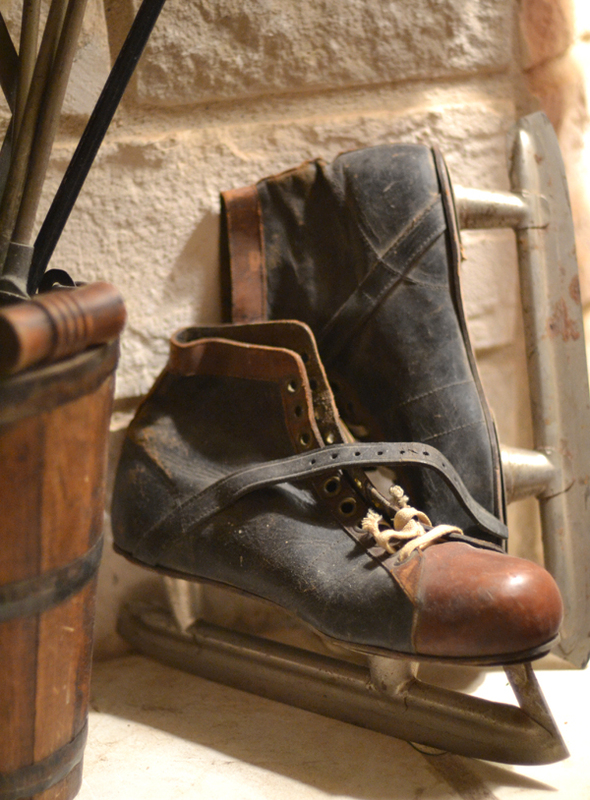 Less is more, well-worn is good, and sentimental is best. 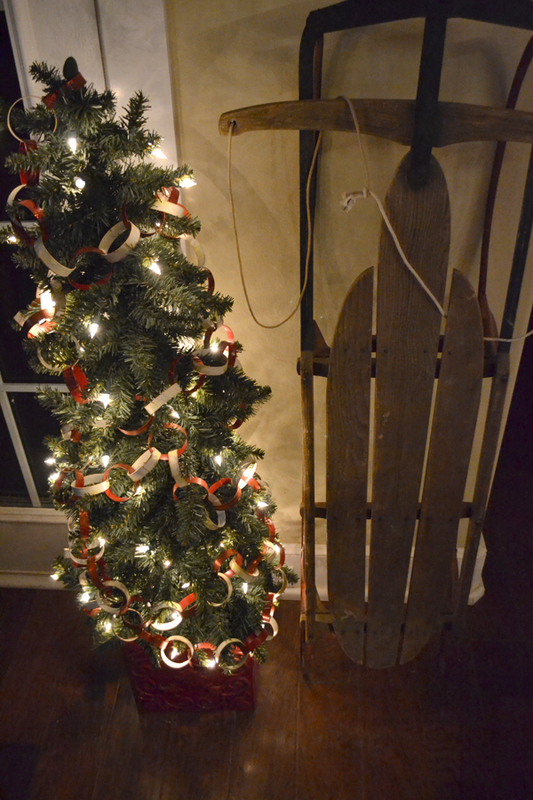 As Christmas grows closer, I hope that you enjoy the season (and decorations) as much as I plan to! Cheers, friends! This weekend, I purged my kitchen and reorganized some of the cabinets, so I decided to put all of my milk jars in the same place (instead of six). 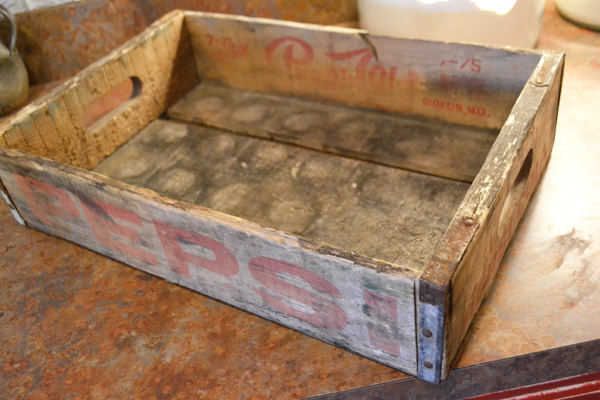 My grandmother had given me this wooden crate, and I decided that it would fit perfectly in a lower cabinet and serve as a “drawer” for my collection. 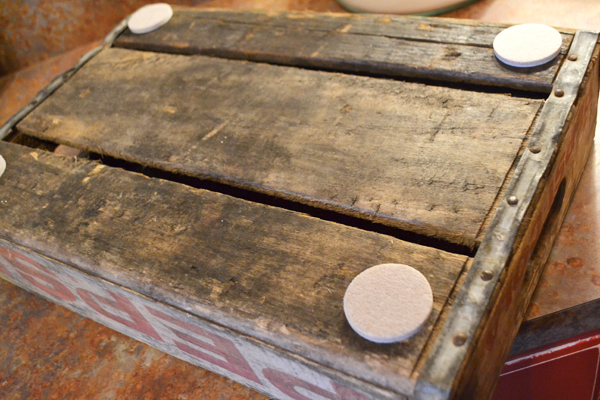 This DIY project was a real doozy – I attached felt pads to the bottom corners of the crate. The End. 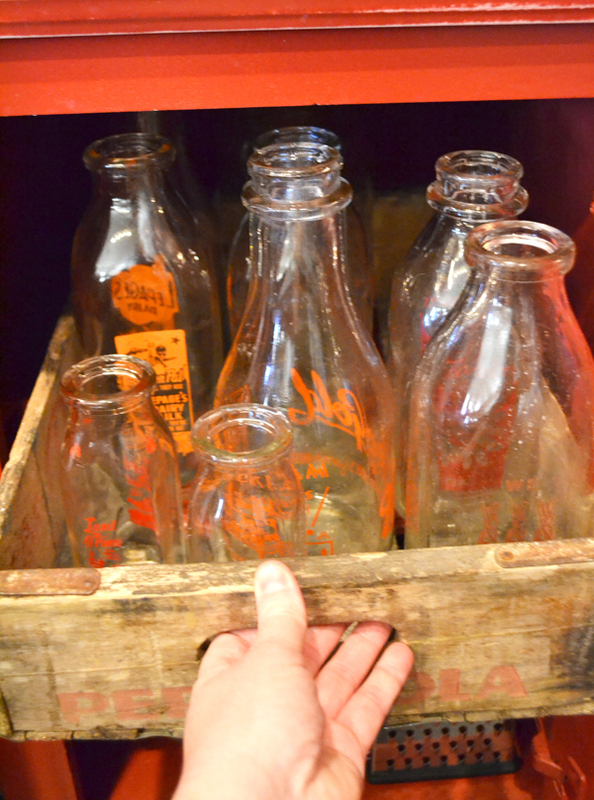 Now I have easy access to all of my milk jar options! Since I already shared a small part of my transition into fall decor, I thought I might show you the completed Halloween mantle look. 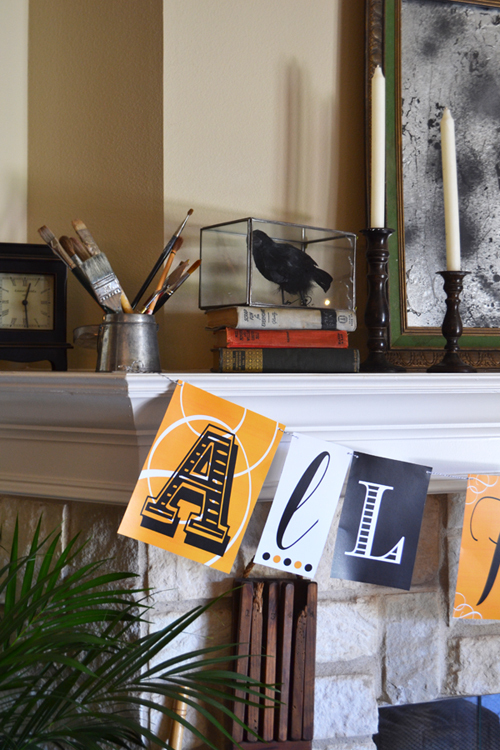 Each year I slightly change up the “theme”, and this time I decided to go with Old Books & Birds (well, specifically, crows). Even though I annually change the theme, I still like to re-use/re-purpose bits and pieces from previous years. 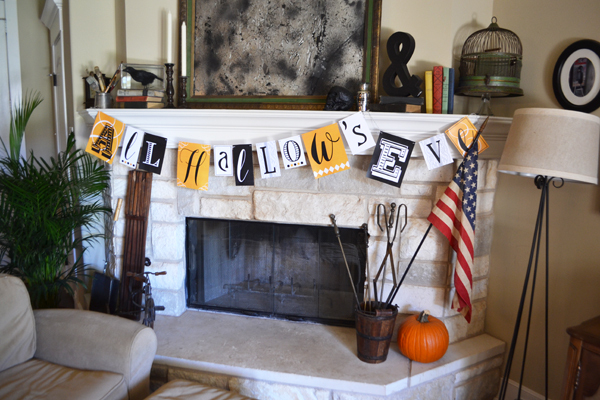 Last year I created this “mirror” to fit a frame I found at an estate sale and made the paper bunting to spell out “All Hallow’s Eve”. This year I added the crow, glitter skull and potion jar. Everything else is part of my normal, everyday decor. On the left side, the paintbrushes were from my grandmother (who was an artist) and the artist brush washer container was from my other grandmother (who just thought it was cute). I added the crow inside the glass box just for fun. The books, clock, and candle sticks are usually on the mantle anyway (just in a different spot). On the right, I brought in one of my favorite items- a vintage birdcage- more books, cardboard ampersand, glittery black skull and potion bottle. Instead of the typical orange and black, I thought it might be more fun to have a little extra color this year – so I swapped out the usual black books for some colorful ones. For some reason it amuses me that the bird is in the box and not the cage (ha, I know I’m kinda weird). I might still add a couple of tiny pumpkins to the mantle shelf, but other than that, I’m calling it done- trying to keep it simple this year. So what do you think? 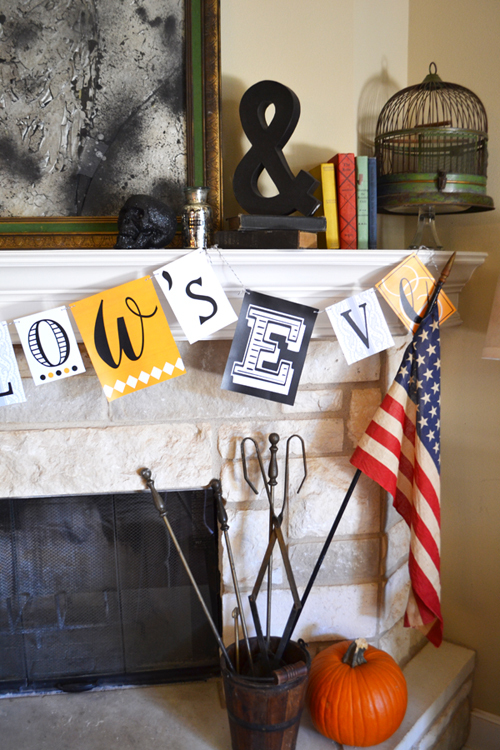 Do you switch up your mantle look or stick with what you know already works? As the beginning of October approaches (and temperatures start to drop), I’m REALLY looking forward to fall – specifically – nights by the fire! A few weeks ago my family was kind enough to help me stock up on firewood, so I should be all set there (for a short while at least). The high for today is supposed to be 78 and the low is 50, so I’m really hoping I get to cozy up by the fire for the first time tonight! 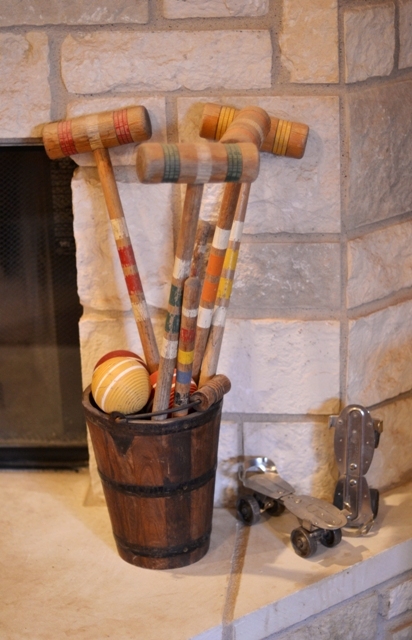 In diligent preparation, I replaced my cheerful, summer decor (an old croquet set) with my fireplace tools. I love the look of both -they’re unique, colorful, fun, seasonal… and in this case – useful. 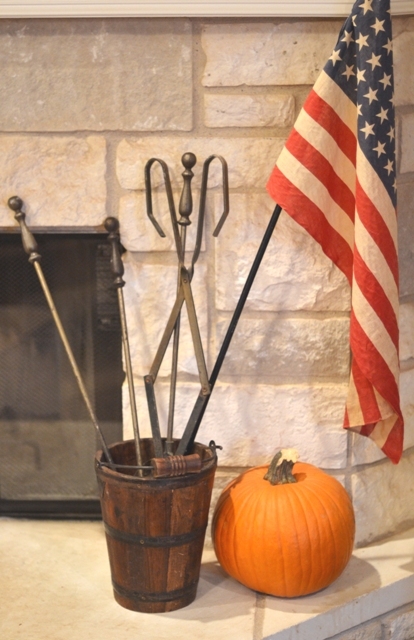 After Halloween, I’ll replace the pumpkin with an amazing pair of vintage ice skates that mom and I got at an estate sale in Michigan (one of my favorite finds). Sidenote: Last year I learned my lesson about putting pumpkins too close to the flame. It was melting pumpkin mess (oops)! This one should be perfectly safe though (whew). A few years after college, my grandmother gave me a small clothing wardrobe (that she actually found it on the side of the road) . 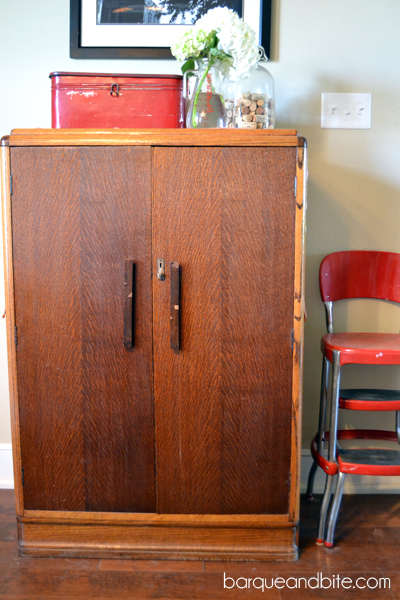 I’ve always loved the cabinet’s little frame, adorable skeleton key lock (but of course the key is missing), and its built-in shelving (on the right side). 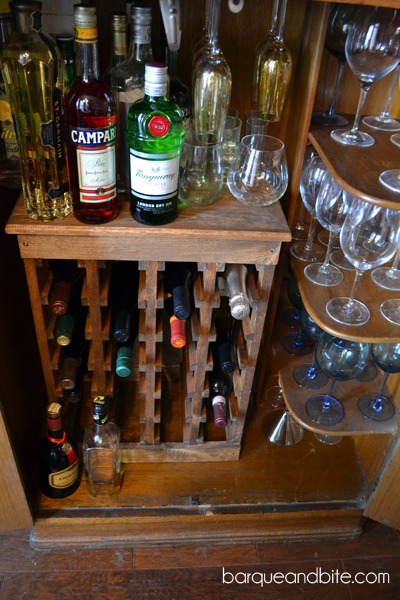 For me, it wasn’t much use as a wardrobe… so eventually I decided it would be the perfect bar cabinet! It’s beautiful, sentimental AND functional. Originally, the cabinet was for clothes, hence the shelving. To create even more storage, I purchased an inexpensive wooden wine rack from World Market, screwed it into the back of the cabinet to make it secure, and then stained it to match. Then, I installed wine glass “runners” in the top of the cabinet. I use those to hold champagne glasses, with wine and martini glass storage on the built-in side shelves. 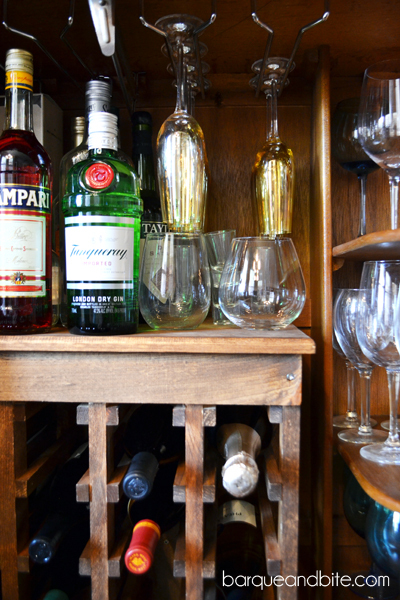 The top of the wine rack also creates an instant shelf, so it’s perfect for more oddly-shaped bottles. 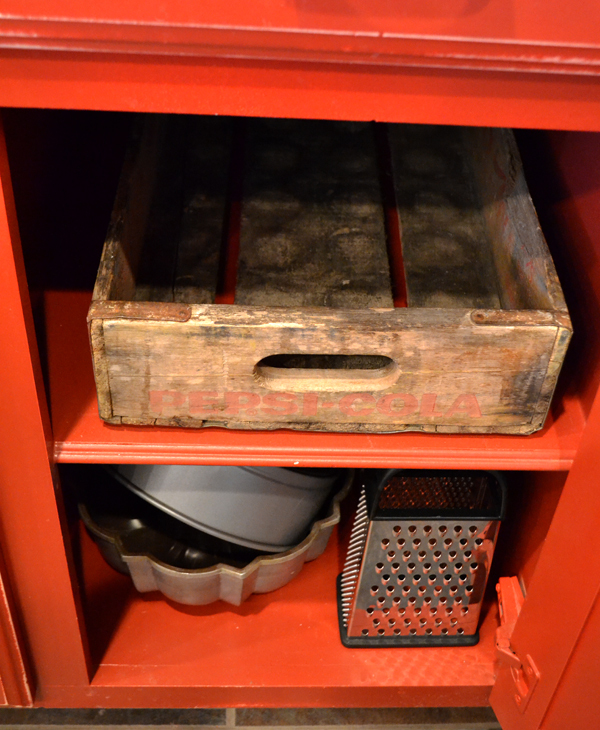 I love how much storage this little cabinet has- with everything tucked away so neatly, it’s just perfect! Do you have a “hidden” bar? Share your creative ideas, I’d love to hear!